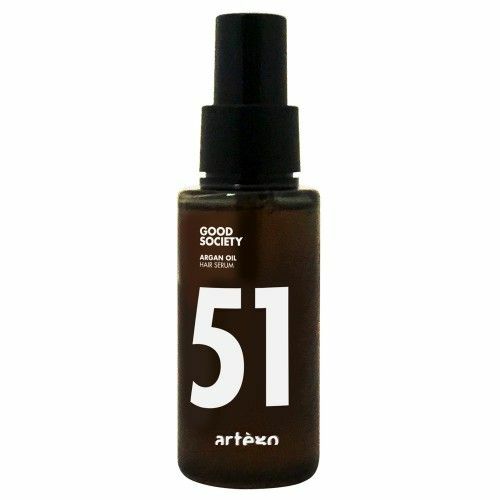 The Artego Good Society Argan oil hair serum gives the hair silky shine, more fullness and volume, it is easier to comb and protect against environmental influences. Thanks to Anti-Frizz Eff ect, the vitalizing serum smooths the hair surface. It contains a natural heat protection. The Argan Oil used comes from a UNESCO Biosphere Reserve and is certified with the natural cosmetics seal "ECOCERT". With the exotic scent of tonka bean and blue orchid. 2 Pumps of the Artego Good Society Argan oil hair serum to the hand and distribute evenly with the fingertips in the hand dry or dry hair. Do not rinse. Wet hair as usual.